Whether you laugh, cry, or cringe, It's Always Sunny in Philadelphia always gets a reaction. It's gone from low-budget cult favorite to one of the longest-running television shows around, and it's done that by doing what other TV shows won't do. (Some might say there's a reason no other TV shows do those things, but those people are called haters.) Let's take a peek behind the curtain and see what you might not know about this binge-worthy favorite … even if you own a pair of Kitten Mittons. When Flash Flood Media caught up with Kaitlin Olson at Comic Con in 2009, they were happy she'd made it, and was cast- and bandage-free. She'd missed the previous year because of an injury, and it was one of the worst you can imagine: She broke her back. While it didn't happen on set (a neighbor picked her up, held her over his head, and accidentally dropped her), she did keep filming through the pain. It happened during Season 4, so that included the scene where Dee gets waterboarded during "The Gang Solves the Gas Crisis." Olson told Elle she still went for it — she was really being waterboarded and she was doing it on her recently broken back. That's just the start of the injury list, and most came because she does her own stunts. She probably pulled a stomach muscle dancing like the inflatable man (she was pregnant at the time), and that scene where Dee ran headfirst into a car door and dented it? She told Yahoo! that was all her — and she ended up visiting a chiropractor. The occasional accident on set has sent her to the emergency room, too. Hollywood.com reported she slipped and sliced her leg open to the bone while the gang filmed Lethal Weapon 6. They called 911, and paramedics were shocked when they showed up: She'd been wearing a blood pack when she fell, and was covered in it. Danny DeVito brings something epic to the world, and his presence makes things feel complete. According to what Charlie Day told Conan O'Brien (via EW), his time on the show — and on Earth — almost came to a horrible end while filming. It happened during that underwater scene, and when they all needed to sit on the floor of the flooding room, DeVito had some issues. "Danny's incredibly buoyant," Day explained. "It was hard to get him down, so we really had to weigh him down to get the shot where we're all holding hands." Cameras cut and everyone else surfaced, but they'd had to add so much weight to DeVito, he couldn't swim up for air. Rescue divers were on hand and pulled him to the surface, but it was such a close call the visibly shaken actor put an end to filming for the day and headed home. Even though no one really, truly wants to ride along on a filming of Project Badass, being able to do it from the safety of your own home might be fun. You can find out, thanks to a VR clip that was released alongside Season 12 episode "PTSDee." The video is, of course, on YouTube (you can watch it above), but cnet says the VR tie-in was made with headset users in mind. There's a 360-degree version that YouTube can't take full advantage of, but you can watch it on any VR device. In case you don't have one (or can't be bothered), just imagine you're an unwitting accomplice who hops on the back of Mac's bike for a stunt that ends exactly like you'd expect. If you happen to watch through the end credits, you may have heard some gibberish on the soundtrack, playing over the title card for RCG, which produces the show. It's not quite gibberish; it's actually a series of messages recorded and played backward before being embedded into the credits. Because that's exactly the sort of thing the internet loves, the messages have been decoded and turned into YouTube videos, like the one above. They're messages like, "You're stupid for playing this forward," "Next stop, brown town," "Sorry for wasting your time and money but thanks for your money," and some others that aren't entirely repeatable in polite company. When Kaitlin Olson talked to Elle in 2016, she had this to say about character development: "That's kind of the goal for us, to make sure these characters age but don't ever grow or change." That's what makes the show great as an anti-sitcom, and that's why Mac being outed as gay was such a big deal. 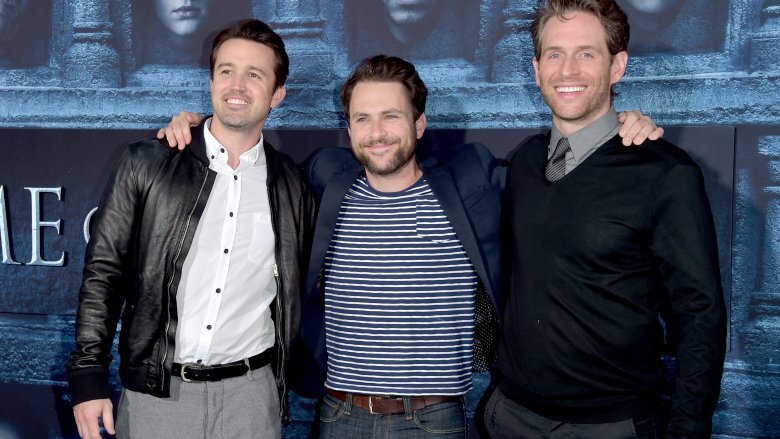 The Wrap talked to Glenn Howerton about why it was so important to first keep Mac in denial for so long, then to finally change the character's attitude in a big way. Howerton said he was originally against it, but they all agreed they had made their point on how far Mac had gone to internalize and deny who he was, and it was a reflection of what they saw people doing in the real world. It was time, and according to Rob McElhenney, it wasn't just coming out, it was staying true to his own personal views. He told Greg in Hollywood his own home life — being raised by two mothers — had a huge impact on his views and ultimately, the show. "It's not really the type of show that lends itself to making political statements … [but] on both sides of the issue are human beings and … the less we treat each other as human beings, the harder it is going to be to find a resolution." IASIP is filled with those moments that make you wonder if you actually heard what you think you just heard, and it'll leave you wondering just how far is too far for the show. Howerton perhaps put it best when he told The Guardian, "We don't mind pushing boundaries, but it's never our intention to be insensitive or offensive. … It's one thing for the characters to be misinformed, ignorant, or bigoted. It's another thing for the show to be misinformed, ignorant, or bigoted." Not only does a plot have to have some kind of humor before it's taken from pitch to screen, but it also has to make sense as something the character would actually do. Howerton also told Vice it was crucial to have stories come from a place the audience could always understand, even if they didn't agree. During the same interview, Charlie Day also mentioned the show is pretty careful not to take a stand when presenting political views — it just presents them in a way that's as outrageous as possible in hopes that people start talking about the issues behind the humor. Say what you will about IASIP, but some moments just make you cringe … until you find yourself wondering whether the cringe-y thing is a good idea after all. Case in point? Rum ham. It's Frank who shows up on the beach with the brilliant idea of getting booze and food at the same time, with a rum-soaked ham. If you're thinking that might actually work, Day says it absolutely doesn't. When he talked to Vice, he said he was in a bar one time and an enterprising, creative bartender sent him a glass of rum garnished with a few slices of ham. Apparently, that bartender hadn't tried it first. "I had a little bit of it," Day said. "I couldn't finish it. I would not order it again." 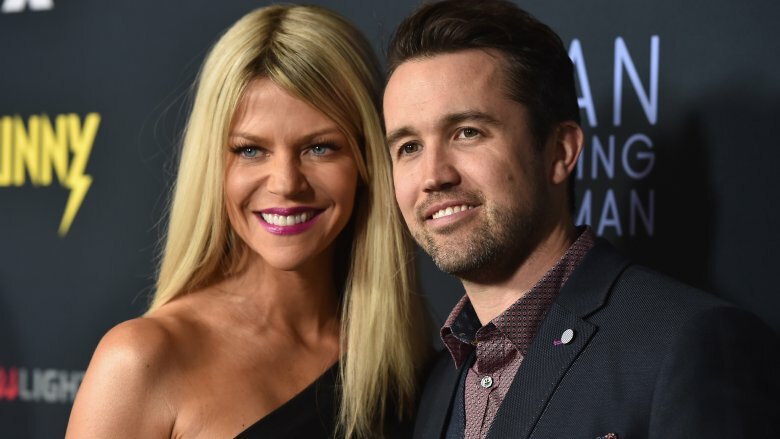 We're used to characters changing their hair or style, but Rob McElhenney completely reinvented himself for the show's seventh season by gaining 50 pounds. The show talks a bit about what was going on in Mac's life, but what about his real-life counterpart? According to an interview with MTV, McElhenney had a very specific reason for getting fat. "Vanity is such a huge part of television, and if you watch any average sitcom, you notice that the actors get better-looking as the years go by. … I thought, if we were being true to the characters … this is what we would look like." For all Mac's obsessions, there's a lot of eating, a ton of drinking, and not too much exercise going on. And it would all take a toll. 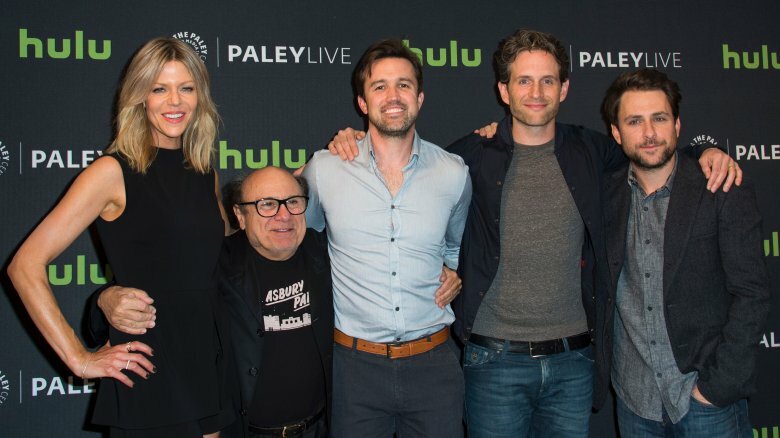 McElhenney continued, "It was less of a stunt or a gag and more of an actual representation of what Mac really might look like at this point in his life." McElhenney said he was eating around 5,000 calories a day (including a ton of donuts, ice cream, and milkshakes laced with weight gainer) to pack on the pounds. It wasn't easy, and he noted that it wasn't easy to drop the weight, either — about 12 pounds refused to come off. It's tough to imagine IASIP any other way, but according to what Olson told Yahoo!, Sweet Dee was almost the show's voice of reason. Let that sink in for a minute. It would have been awful. Olson said she almost turned the role down because it was too boring, and fortunately, the writers were open to new ideas. While they used the argument that they had never really written for women much, Olson said she came to the table and said, "Well, don't write for a woman. Just write another funny character. … Don't think about it as male or female." She elaborated in an interview with Flash Flood Media, saying that originally, Dee's part wasn't just boring, it was small. Fortunately, she signed on with the understanding she'd be involved in growing the character into another member of the gang, and everyone can agree that was the right decision. For most sitcoms, the decision to do a musical episode is one that's questionable at best. 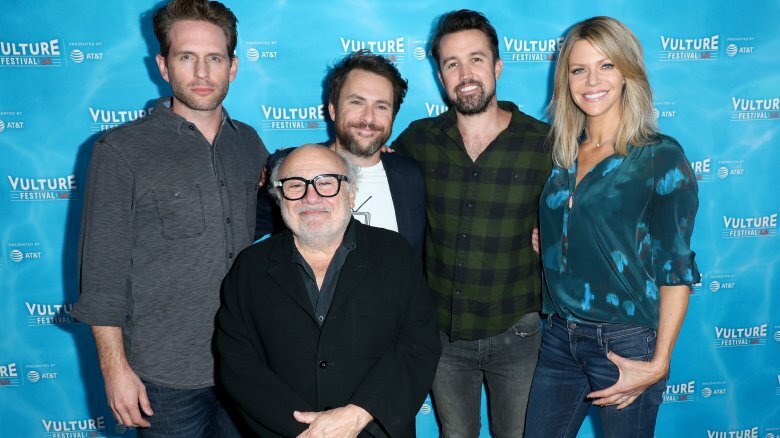 But IASIP isn't the usual show, and "The Nightman Cometh" was such a popular episode it was adapted into a completely live, honest-to-gosh rock opera (via Playbill). It wasn't just a random bit of schtick they needed someone else to write, either, as Day is an honest-to-gosh musician. He told Spin that he "grew up in a house full of musical instruments." His parents were both music teachers, his sister has a degree in choral conducting, and he always counted songwriting as one of his hobbies. Vanity Fair adds he started playing the violin when he was 3, later picked up the trombone, the piano, and the Dylan-inspired combination of guitar and harmonica. Day, who grew up about six hours outside of Philadelphia, said music was a must in the car, too — especially since their 1985 Honda Accord didn't have a radio. It's a blink-and-you'll-miss-it sort of scene, mostly because it's such a typical Frank thing. DeVito's character gets in a bit of trouble for grinning pretty inappropriately at a waitress, then watching her walk away. That's the clip, and the waitress? That's DeVito's daughter, Lucy. It's already a pretty creeptastic clip that sums up Frank's entire view of young, attractive women. He mentioned the clip in an interview with Vulture, on the heels of another comment. DeVito was accused of being drunk during another interview (he wasn't), and just said, "I like that stuff. I think it's good to churn it up and provoke." After more than a dozen seasons, it's safe to say the cast, crew, and writers have come a long way since filming that first pilot episode. 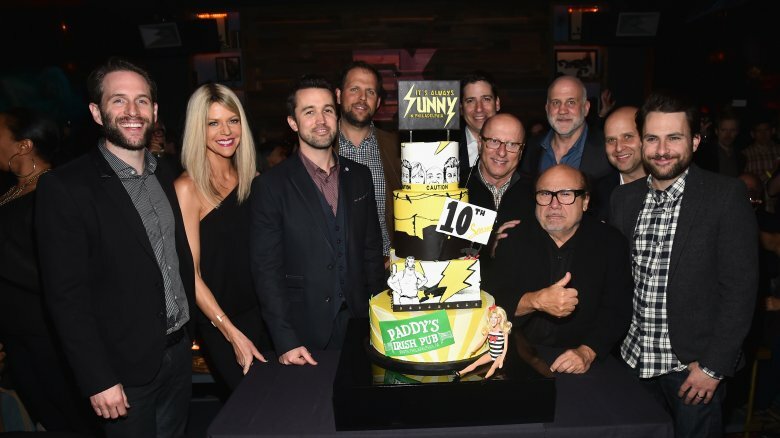 Coming up with new ideas isn't all fun and games, either, and while the characters might not change, McElhenney says the writing has become much more focused. He told IGN that even starting after the first few seasons, they got a feel for everyone's strengths and weaknesses, and wrote to that. He also said some episodes can take a week to write while others sit for months, but they all start with someone seeing something in the real world and pitching it to the others: "How can we make that funny?" Since the core group of writers are also the stars, you might think they know their own characters best, and push for episodes that revolve around themselves. That's not the case, though, according to what Howerton and Day told Collider. Day in particular says he tends to pitch ideas that revolve around Dennis because it's his favorite character to write for, and added he tends to forget about his own character. They've learned some important lessons over the years and take copious notes when they're discussing ideas. It's tough to watch IASIP and not want to go hang out with the gang. Not for long, of course, but just for a bit. You actually can … sort of. In 2009, real-life couple Olson and McElhenney invested in a real-life Philly bar, according to The Philadelphia Inquirer. The bar — originally called Skinner's — was re-named Mac's Tavern, and while Olson and McElhenney signed on to invest, several of their longtime friends would be in charge of running the day-to-day business. They may not have been involved in cracking the Liberty Bell, but the bar still has an impressive history. The building dates back to at least 1693, and that's definitely enough historical cred to get them on any walking tour, no shenanigans needed.